A cairn commemorates Major Thomas Mitchell who passed the the area during his exploration in 1836. The cairn was unveiled in 1930 and in 1936 a monster picnic was held near the site. 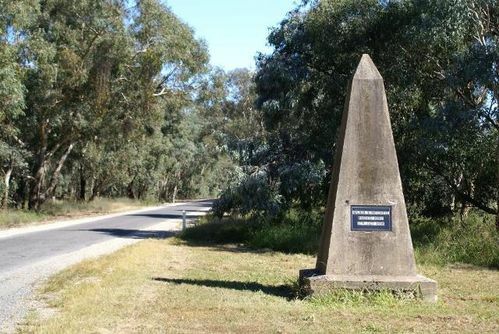 Chiltern, Friday.- A cairn at Chiltern Valley, erected conjointly by residents of Chiltern Valley, the progress association, and the shire council, in the path of the explorer Major T Mitchell, who crossed the Black Dog Creek near the spot to New South Wales on October 16, 1836, was unveiled today by the president of the Chiltern Shire Council (Councillor Sutherland) in the presence of a large assemblage of residents and visitors. Before the unveiling Mr Herbert Hansford, a member of the Historical Memorials committee, Mr. K. Long, member of committee, Mr. C Dales, secretary, and Councillor Poole delivered addresses. At the end of the ceremony Dr. Harkin moved and Councillor Braun seconded a vote of thanks to the visitors. Argus (Melbourne), 15 November 1930. CHILTERN.—- To commemorate Major Mitchell's crossing of the Black Dog Creek, near the Chiltern Valley mine dumps, on 16th October, 100 years ago, a monster picnic will be held at Orange-grove, Chiltern Valley, and a turkey supper and dance in the school room at night. Age (Melbourne), 12 October 1936.